EBU and Eutelsat sign deal for distribution of live sports and news events. Paris, Geneva, May 2016 – The European Broadcasting Union (EBU), the premier distributor of sports and news content for the world’s top broadcast and media platforms, and Eutelsat Communications announce the signature of capacity contracts on four Eutelsat satellites. 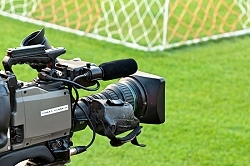 The capacity will be used to carry live broadcast signals of flagship events in the sports calendar, including all major European football championships and this year’s most popular summer sports events. Using the EUTELSAT 65 West A, EUTELSAT 12 West B and EUTELSAT 5 West A satellites, the EBU will extend its existing and substantial footprint to new regions, notably Africa with a full-time lease for capacity. The new leases coincide with the cornerstone renewal and expansion of capacity contracted by the EBU on the EUTELSAT 7B satellite. With this new major long-term agreement EUTELSAT 7B remains the core element of Eurovision’s network over Europe, the Middle East and North Africa for distribution of live images of all major sporting and news events shown by European broadcasters. Graham Warren, Network Director at Eurovision, said of the new contracts: “Our objective has always been to provide our customers with highly reliable and innovative production and distribution services with the best possible conditions, technically, operationally and of course financially. The EBU knows it can rely on a number of satellites in Eutelsat’s fleet to ensure video distribution across the world, most notably the European continent in its larger perimeter and the African continent, which represents a promising new marketplace for Eurovision services; and in an ever growing environment for live video services, in multiple formats, from second screen to UHD."